The Studios is offering Spring 2019 programs at no charge to LeyVa and Bulldog Tech students! Sessions have started already for CREATION STATION, HACKRZ CLUB and MULTIMEDIA MASH UP! To register, pick up a form at the student center. 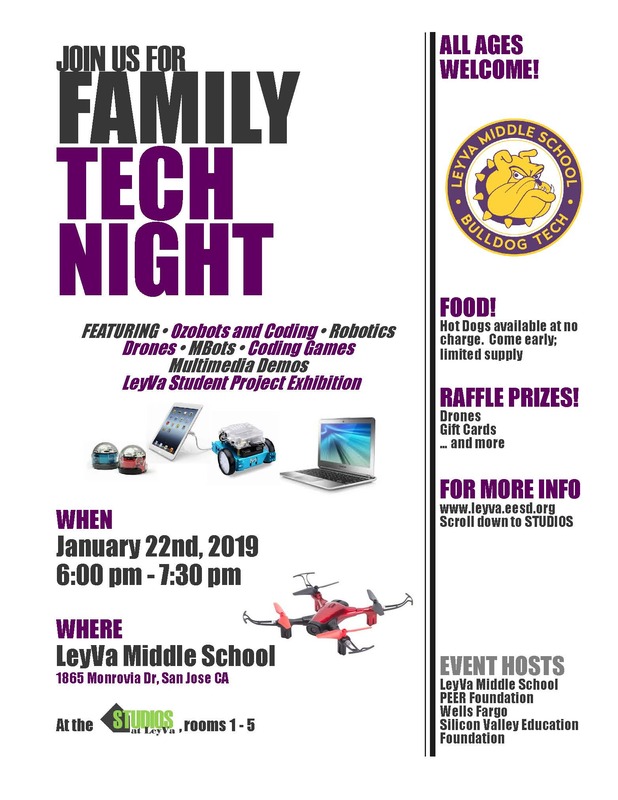 Thank you, Leyva Bulldogs, for making the Family Tech Night such a huge success! At least 60 students and their families were in attendance to celebrate computer science and the Change the Future Grant from Wells Fargo and Silicon Valley Education Foundation. The Studios is hosting 6th grade classes from feeder schools for a day of campus exposure and multimedia! Students enjoy a campus tour given by leadership students, and complete a movie trailer about a relevant general education topic. The STUDIOS at LeyVa is a resource center on the LeyVa Bulldog Campus made possible by an organization called PEER in partnership with LeyVa, Evergreen School District and East Side Union High School District. We will be working this year to provide students with free access to programs and experiences in subjects like coding, robotics, 3D printing, animation, web design, music production and business skills. The Studios are open both during and after school. CLICK HERE TO SIGN UP FOR THE 6th GRADE DISCOVERY EXPERIENCE!! PEER Foundation, Partners in Education Enrichment Resourcing, is a nonprofit organization assisting with the management of The STUDIOS at LeyVa. Our friends at PEER are working to offer innovative and engaging learning opportunities to our students. Learn more about PEER at www.peerfoundation.net.